It's been a while since I've upped something from this longstanding paragon of Germany's marginal fringe. Time to rectify that. 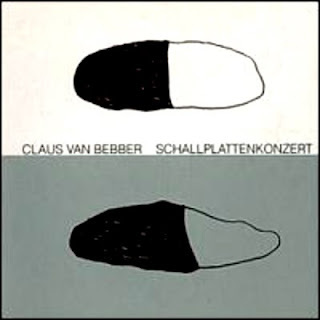 Van Bebber was initially a member of the Neue Deutsche Welle outfit Z.D.L. (covered at length elsewhere), and latterly emerged over the following decades as a stalwart of the German improv community, his specialty being seasick symphonies of vinyl abuse in the mode of Phillip Jeck, Christian Marclay and Milan Kniszac. Schallplattenkonzert is a smashing example of the sorta dislocated trans-historical frisson that emerges from shrewdly pastiching several generations of antiquated and marred vinyl in an acutely sensitized fashion. No comments? This stuff is so great. Captivating pap that has really added to my recent vacation in Heidelberg. Keep this coming! claus is a genius in what he´s doing and how he´s doing this. i know him personally as an exceptionally positive human being and an 100% consequent artist. see him live in concert if you can!